Ten years ago, Hell Diver Xavier “X” Rodriguez fell to Earth. Those he left behind went on without him aboard the airship he once called home. Michael Everheart—the boy once known as Tin—has grown into a man and the commander of Hell Diver Raptor Team. While Michael dives to help keep the Hive in the air, Captain Leon Jordan rules with an iron fist at the helm of the ship. But unrest stirs under his strict leadership as a prophecy of hope sweeps the lower decks. When a mysterious distress signal calls the Hell Divers to the surface, Michael and his loyal team begin to uncover long-buried truths and the secrets Captain Jordan will do anything to keep. They dive so humanity survives … but will they survive the ultimate betrayal? USA Today bestselling author Nicholas Sansbury Smith delivers another heart-pounding thriller in Hell Divers II: Ghosts, the second book in the acclaimed science fiction series. 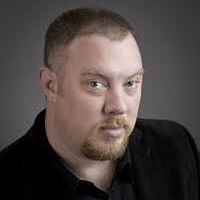 Nicholas Sansbury Smith is the USA Today bestselling author of the Hell Divers trilogy, the Orbs trilogy, and the Extinction Cycle series. He worked for Iowa Homeland Security and Emergency Management in disaster mitigation before switching careers to focus on his one true passion—writing. When he isn't writing or daydreaming about the apocalypse, he enjoys running, biking, spending time with his family, and traveling the world. He is an Ironman triathlete and lives in Iowa with his fiancée, their dogs, and a house full of books.